Our X’mas Gift Packs are now available, and selling fast! Your purchase will help us raise much-needed funds to continue our animal welfare services and activities! Available at our centre in Ampang Jaya, events and via e-mail orders! 3,930 Cats & Dogs Neutered in 2018! 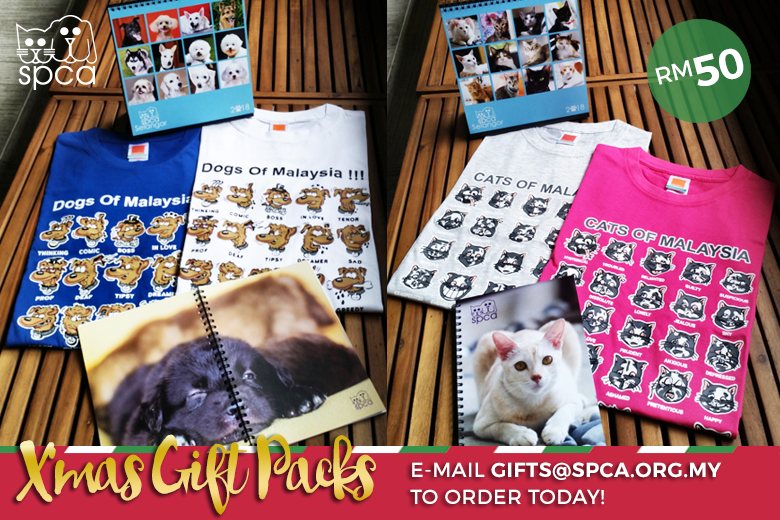 Sponsor-A-Dog @ SPCA Selangor for RM90! 9 Ways To Celebrate World Animal Day! Receive news & updates via our eNewsletters. Like us. Follow us. Watch us! Founded in 1958, Society For The Prevention of Cruelty To Animals (SPCA Selangor) is a well-respected and trusted animal welfare Non-Profit Organisation (Reg No. 1320) based in Ampang Jaya, Selangor (Malaysia). Over the years, the organisation has gained tremendous good-will, recognition and support from animal lovers all over Malaysia. Copyright © 2019 SPCA Selangor. All Rights Reserved.